This forum is now read-only because we had to stop giving medical advice. However, Sarah gave medical advice over 2000 times in this forum so using the search function above this text, you will very likely be able to find the answers you're looking for. 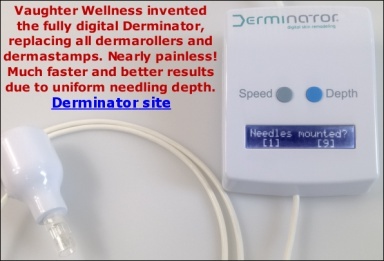 If you are our customer and want to send us before-and-after pictures for promotional purposes to receive a possible refund on our Derminator® machine, please file a ticket at http://owndoc.com/support instead. Please only post questions when you could not find the answer searching this forum or our instructions. Pre-and post-sales questions about our products only. Thank you! One of our experienced customers has made a owndoc dermarolling information video for us in which she demonstrates the correct dermarolling techniques. Please note that she is not moving the roller sideways a few mm, every roll, contrary to our recommendations. The pupose of the video is to show the correct technique (lifting the roller after every rolling motion). The slightly-sideways positioning is used on larger skin surfaces. All that counts is to achieve sufficient prick density. As long as any star patterns are avoided, you can use any other method to achieve sufficient prick density. We suggest moving sideways a few mm after every roll, but on smaller skin patches on the face that may not be practical. My comments should not be considered medical advice. I have seen other videos using faster, back and forth motions. Is this okay? I'm afraid I would become very tired of doing this if I have to do it so slowly and deliberately. It's OK as long as you lift the roller after every roll. To anyone reading this, IME it is absolutely imperative to take the time to lift the roller and I wouldnt go go too fast either, were talking about your skin.Back in the day I gave myself some nice little drag/trackmarks from not lifting the roller at the end ( it was with a crap roller also though which I suspect was yet another problem). Im fixing them now with owndocs products and method, but yea follow the instructions on here and you will see results. Thank you for writing about your experience, Truvision. Lets say I am trying to roll my forehead....from left to right horizontally. Do I need to repeat the exact same area 8 times, before I move the roller a few millimetres down? I am guessing that if I am only moving the roller down a few millimetres for the next roll, I am still rolling a little bit the previous area no? Would like to clarify this before I start rolling...the repeating eight times bit...I didn't see it in the instructions manual, It only says move the roller slightly and roll once. So far I am only stamping with 0.5 so would love to try this now, with my new 1.o mm dermaroller. You can either do it as explained in our latest instructions, or you can do it totally differently: Just roll "randomly" around the skin, about eight times over each part of the skin. Also this is explained in the instructions. All that matters is to achieve a high prick density. It is not practical to roll smaller parts of the skin the way we recommend in the instructions. All that really matters is not to use the outdated advice of the "star pattern" because that causes a bad prick distribution (too many in the center and too few at the edges), as explained in our instructions. Thank Sarah that helps so much. I understand the star pattern and I wont be doing that, I ve read the instructions a couple of times. What I didn't understand is whether you roll eight times and move the roller down exactly the width of the roller, and do another 8 times on new area, or do ONE time and move the roller very slightly down and do another one time and keep doing that. So since Randomly is fine I can do either or Cant wait to start the rolling now...I am stamping every four days, very densely, and I do see blood sometimes coming out. Yesterday I pricked one of my frown lines for the first time! It didn't hurt that much no. And I did insert it all the way in and pricked all along the line from top to buttom. I will keep doing this and hopefully I will post some pictures in a few months time. Only thing that is bothering me right now is the nasolabials, sometimes they are so prominent, sometimes I can hardly see them. which means sometime I lose weight and they really stand out. The stamping with the 0.5 didn't help much, and they do become very red. I will experiment with the roller 1.0 that I hve. Thank You so much for the informative answers.